Slice banana into 24, 1/4-inch round pieces. Dip each round into lemon juice, being sure to coat the entire surface of each one. Set aside. Wash and dry the grapes. Set aside. Wash and dry the strawberries. Cut off the stem side of each one, creating a flat surface. 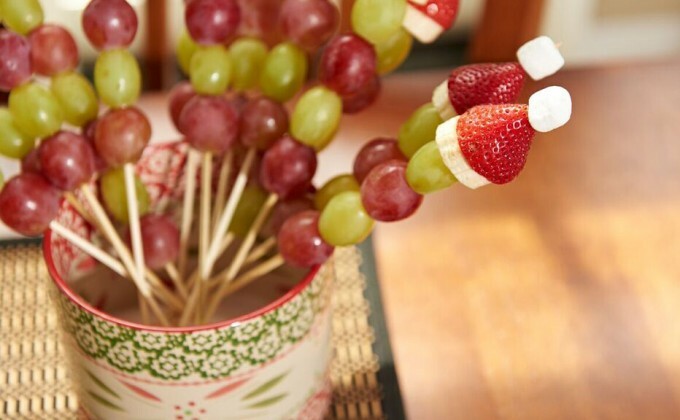 To assemble, slide a skewer through the center of alternating red and green grapes. At the top end with a green grape, then a banana slice, a strawberry and finally a marshmallow. Serve immediately in your temp-tations® Stack-A-Bowls.